Vitamin D helps maintain strength. Iron helps maintain alertness! Vitamin B12 to help energy! Free from artificial colours. 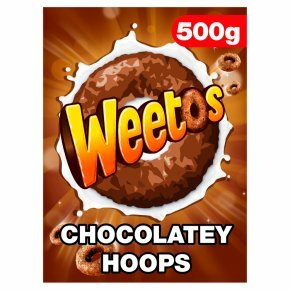 Suitable for vegetarians.High in Fibre Wholegrain Vitamin D Giving you a great tasting start to the day, Weetos also? Helps maintain alertness - Iron* (*Contributes to the reduction of tiredness & fatigue) Helps release energy - Vitamin B12** (**Vitamin B12 contributes to normal energy yielding metabolism) And are also? Low in salt and saturated fat Who says they're just for breakfast? Snack on Weetos too!